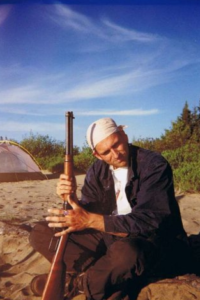 Between June 1999 and March 2001 we travelled several times to Gerald Ottawa’s bush camp where he taught us, both in summer and in winter, lots of ancient skills and techniques of the life in the bush. The bush camp was situated at Lake Kempt near Manawan. We immediately felt at home with the Ottawa family. Thanks to them we would, later on, be introduced to other families and other Canadian First Nations.The Atikamekw are the indigenous inhabitants of the area they refer to as Nitaskinan (“Our Land”), in the upper Saint-Maurice River valley of Quebec (about 300 kilometres (190 mi) north of Montreal), Canada. Their population currently stands at around 4500. One of the main communities is Manawan, about 160 kilometres (99 mi) northeast of Montreal. They have a tradition of agriculture as well as fishing, hunting and gathering. They have close traditional ties with the Innu people, who were their historical allies against the Inuit. The Atikamekw language, a variant of the Cree language in the Algonquian family, is still in everyday use, making it therefore among the indigenous languages least threatened with extinction. But their home land has largely been appropriated by logging companies and their ancient way of life is almost extinct. Their name, which literally means “Whitefish”, is sometimes also spelt “Atihkamekw”, “Attikamekw”, “Attikamek”, or “Atikamek”. The French colonists referred to them as Têtes-de-Boules, meaning “Ball-Heads” or “Round-Heads”. A small number of families still make their living making traditional birch bark baskets and canoes. For food, they fished, hunted, and trapped, supplementing their diet with agricultural products such as corn and maple syrup that the Atikamekw made by boiling the sap extracted from maple trees. Implements would be made of wood and clothing of animal hides, and obtaining other necessities through trade with tribes in nearby areas. 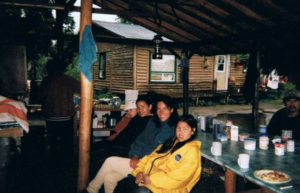 In summer, the Atikamekw would gather at places like Wemotaci. Then in the fall, they would pack up and disperse through the boreal forest for the winter. When the French arrived in the region, the Atikamekw became increasingly dependent on externally controlled trade, particularly the fur trade. They were considered a peaceful people, sharing the region with the Innu (Montagnais) in the east, the Cree in the north, and Algonquin to the south. But they had conflicts with the Mohawks. Through their Innu allies, the Atikamekw caught devastating diseases that were brought over by the Europeans. Around 1670-1680, a smallpox epidemic devastated the Atikamekw tribe. The French pulled the Atikamekw into a trade war between the Montagnais (Innus) and the Iroquois in which the Atikamekw and Innus did not fare well. Those Atikamekw who had survived the smallpox were slaughtered by the Iroquois. However, at the start of the 18th century, a group called “Tête-de-Boule” reappeared in the region. While there exists no certainty as to the origin of this group, they may have been a regrouping of the few Atikamekw survivors and who were possibly associated with other indigenous nomadic tribes. But they are considered to be unrelated to the former Atikamekw even though they lived in the same area and took on the same name. Traditionally, the Atikamekw lived in dome-shaped homes, covered with bark called “piskokan”. The floor was carpeted with spruce boughs and furs were used as beds and blankets. The Atikamekw had developed a technique for preserving meat by smoking and drying, a process still practiced by some families. Collected berries were processed into a paste that could be preserved for several weeks. The making of hunting equipment (bows, snowshoes, sled dog) as well as clothing and blankets, was in former times a task necessary for survival. Like all First Nations, the Atikamekw stood apart by a special way to decorate their clothing. One distinguishing feature were the bells covering their ceremonial robes that were made of bones emptied of the marrow. The Atikamekw have been recognized for their skill in crafting birch bark items such as baskets and canoes, decorated with beautiful designs. These skills were always transmitted from generation to generation so that even today they are still practiced, giving them the nickname “people of the bark”. Interestingly, handicrafts made from birch bark is less practiced in Obedjiwan than in other communities, since it is located in the boreal forest where conifer trees dominate. Among Atikamekw, the year is divided into six seasons. In every season, there is a principal activity. The seasons begin with Sîkon, a pre-Spring in which the Atikamekw used to manufacture bark baskets, which can contain maple-sap gathered in this time of year. After Sîkon is Mirôskamin, Spring proper. 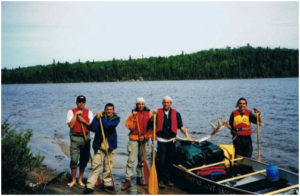 In this season, the Atikamekw would go fishing and partridge hunting. These activities continue through Nîpin (Summer). During Takwâkin (autumn), the Atikamekw would go moose hunting. A successful hunt required the careful removal of the skin of the moose, offerings are made, and then the meat is jerkied for preservation. Women would continue to remove the hairs from the moose hide, then soak, de-flesh and tan the hide, then make thin strips of leather for snowshoe netting. During the onset of winter, or Pîtcipipôn, the men would go trap for beavers. During the winter, or Pipôn, the men would make nets to fish under the ice, while others produce snowshoes.